The purpose of this article is to help your business compete more successfully by improving – or even introducing – performance appraisals, also known as performance reviews. Be honest – are you rolling your eyes right now? Sometimes they are no more than a box-ticking exercise that adds low value bureaucracy and paperwork. At others they may even involve needing to have (or even trying to avoid!) uncomfortable conversations about things that often matter to people. Career and work performance can play a big part in some people’s self-esteem, and even more so if the subject of pay, bonuses and potential promotion are wrapped up in your appraisal system too. The truth is that businesses don’t achieve high performance. People in businesses do. You’re spending money employing people, money that goes well beyond their pay. Training, cover for absence, teambuilding, pensions, NI, liability insurance… So it makes sense to put processes and systems in place to get the best return on your investment. Because people are people, they will most likely do well for you if they feel valued, enjoy their work and feel that they are making a useful contribution in some way, including when the job they do is routine or relatively low skilled. We all want and need to feel that we make a difference at work, however small. If you’re like the vast majority of the many entrepreneurial leaders that I know and have worked with over the years, you also want to be a good boss and create a meaningful, positive and productive environment for your team, as well as achieving business success. Sustainable, healthy business performance rarely happens without engaged, valued employees. For all businesses, and especially entrepreneurial ones, a powerful capability is for people to be able to have really effective performance conversations on a regular basis. Regular one-to-one meetings between managers and the individuals in their teams are essential. If you’d like some specific tips and advice on how to carry these out, along with a free, downloadable one-page planner, have a look at my earlier article How to get the most out of your one-to-one meetings. You’re losing opportunities to develop, coach and work with your people to improve their performance in ways that will increase their job satisfaction and help your business to grow. You’re not able to spot times when people might be veering off course a little, and so make a minor correction to their trajectory to avoid a potentially bigger problem later. You are making it much harder for yourself to carry out performance appraisals because issues become ‘stored up,’ memories of the good and the not-so-good fade, and the whole thing can feel more awkward because the person’s performance isn’t something either of you are accustomed to talking about. You’re not helping yourself when it comes to demonstrating fairness, and justifying decisions around pay and bonus if people have no clear understanding of how well they have performed, and what they could have done differently to achieve more. As James Clear demonstrates time and time again in his book, Atomic Habits, really small changes implemented consistently over time can lead to remarkable results. Maths show that if you improve by 1% every day for a year, then you will finish the year 37 times better by the time you’re done. It is usually just as easy to make a choice to be 1% better as it is to choose to be 1% worse. The choice doesn’t seem much in the moment, but over time the impact builds up. If you’re interested in this, you might also enjoy the concept of the Compound Effect by Darren Hardy. Having regular, effective performance conversations with your people encourages both them and you to aim to be and do that bit better each time, and that all definitely adds up. The big takeaway at this stage, then, is that if you’re not having regular performance conversations through one-to-ones, then beginning to do those will be a great win for you. Lack of time is not a good reason (i.e. it’s an excuse!) to not have one-to-ones. If you really, truly, honestly can’t find the time, give the responsibility for them to someone in your business who will be good at them and make sure that they happen, in line with your leadership vision and goals for your company. If you do have regular one-to-ones already, that’s great. I’m preaching to the converted. Your opportunity now is to take them to the next level. Focus on making sure that they are as effective as they can be, and try using the planner, structure and tips that you can find here. Hopefully, you’ve resolved to have regular, effective performance conversations. As a result, your performance appraisals (also called performance reviews) will be so much easier and more meaningful, both to you as the appraiser and to the individual being appraised. Now to put in place a performance appraisal process that really works well for your entrepreneurial, growing business. So many businesses jump into individual performance reviews as part of an ongoing cycle, but to get the most success the first place to start is with your business plan for the year. The business plan pyramid below helps to illustrate that the vision, goals and targets for your company need to be broken down into smaller tasks, activities and sub-targets for your people. These will form their individual objectives for the coming year. 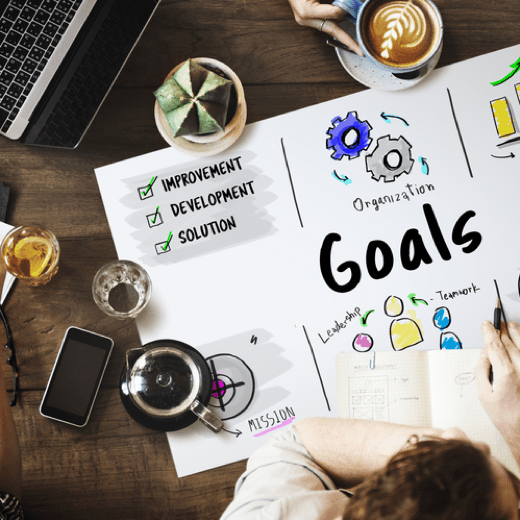 The idea is that when you aggregate everyone’s individual objectives for the year, they add up to a result that is somewhat better than your business plan aspirations. I recommend building in objectives that give a slightly better result than the one you are realistically aiming to achieve to provide some contingency. Some people or projects might not do as well as you hope, so to an extent this approach provides a bit of insurance against that. If you’ve completed my free online programme, Creative Kickstart for 2019, you can use the plans and action plan that you created for the year as the starting point for setting individual performance objectives for the year. Creative Kickstart for 2019 is still available for you to join. Click here for an overview and to download the free playbook that contains all the insights and activities you will need, and use the videos that accompany each session on our Youtube Channel here. If you need any help, please just send me an email to [email protected] and I will help you to get access to everything. You’ve now created specific projects and KPIs that together will achieve the business plan outcomes for the year that you’re aiming for. You’ve also got some ideas in terms of which individuals in your business will be responsible for managing and delivering each of the project parts and KPIs. Studies of people at work consistently show that goal clarity – i.e. having a clear understanding of what success look like – is essential for people to perform to the best of their ability. The next step is to create clear, actionable performance objectives for the year for each individual. It can be helpful if these are SMART, and much has been written about this – if you’d like a refresh or learn more about it, here’s some really good and detailed advice from the CMI. The task or activity to be done. The standard or result to be achieved. How progress towards the objective will be tracked and measured throughout the year, and what the interim review phases will be. Photos: We had some specific individual and team objectives from our involvement in the fabulous Northumbrian Water Innovation Festival at Newcastle Racecourse last summer. The best number of objectives for each person is a matter of debate, but essentially between 5 and 8 is good guide. I tend to prefer 5 because the objectives are more likely to be memorable and more straightforward to focus on. One thing to watch is that to make sure that the objectives you set don’t lead to unintended consequences. For example, an objective with a strong focus on profit might compromise customer service decision-making, and lead to less profit overall. So when setting objectives, make them balanced to have the overall positive impact across customer service, financials, operations, employees and so on that you’re aiming for. Of course, as the year progresses, some things may change and you may need to revisit the objectives from time-to-time to make sure they are still relevant and appropriate. Businesses that experience sustained success place as much emphasis on how people achieve results as they do on the results themselves. To protect and positively develop the culture that you want to create for your business, your performance appraisal process also needs to recognise and reward people working in alignment with the company’s values, as shown through their behaviours. Your company’s values provide an important checkpoint for employees to reflect upon, to ensure the behaviours they display are consistent and demonstrate a commitment to the mission and values of the business. When employees’ daily work behaviours support your company’s values, the result is a business that is more unified, mission driven and ultimately more successful. Including a values based performance review in your appraisal process will be an opportunity for learning and, most importantly, exploring what has been achieved as a result of the contributions and behaviours of the individual. If you have shared your vision for the business for the year with your team, or even better, co-created it with them, communicating individual performance objectives will be much more effective because every person will be able to see how their own contribution fits into the bigger picture. This is called creating ‘line of sight’, an expression that comes from the military that means ‘distance to target’. We know that people who can see the different, interdependent elements that drive the business’ success and how they relate to his or her role and rewards are more engaged and effective at work. If you’d like any help with employee co-creation of your business plan, or with sharing your vision, do give me a call 0044 7879 631270 or email [email protected] to book in a no obligation discovery call to identify how I can support you with this.